What is Formula 1 Home? Formula One is popular with name F1 racing. Speed is the key and gives the excitement and thrill in riding the bike. We will learn about the rules and regulations involved and all other elements required in F1. This tutorial is to give you brief knowledge on F1 racing. However, this tutorial is not complete material on the instructions to learn the racing. People who want to learn and gain things on F1 racing are preferred audience. 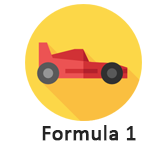 This tutorial acts a guide for learning aspirants in understanding F1 racing. People should have zeal to learn the sport and passion to gain interest.